Demanding for immediate termination of driver, free and fair investigation and to immediately compensate the family of late Apsana Talukdar by department of Horticulture, the Student’s United Movement of All Arunachal organized a peaceful candle march from Akashdeep to Tennis court IG park. When interact with elder sister of late Apsana, Miss Rupsana Talukdar informed that after the incident at least representative from the same department could have turn up to meet grieve family but till date no officers and representation from Horticulture department has approach to them. “FIR has been already lodged at Itanagar Police Station but yet to register, police officer said charge sheet will be made after receiving Post Mortem report,” said Rupsana However a UD case have already been registered at Itanagar Police Station Vide UD Case NO- 235/17 u/s-279,338/304 (A) IPC. 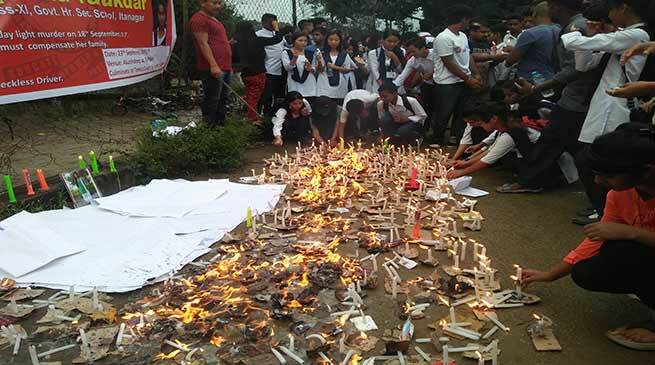 Students from the Government Higher Secondary School Itanagar and members of SUMAA, while holding placards in their hand ‘It was not accident but a day light murder’ had also observe one minute’s condolence for departed soul. Earlier, late Apsana Talukdar, 17 years old, daughter of Allauddin Talukdar was hit by speeding bus of horticulture department around at around 9.40 am on Monday when she was on the way to school in which one other school boy was also injured. SP Capital Sagar Singh Kalsi in an interaction said that action have already been initiated, the driver of the Horticulture department staff bus have instantly arrested and the vehicle have been seized. Parliamentary secretary (Home & Education) replying to the media person question the role of state government and silence in giving condolence and compensation Pani Taram said that the state government have sought report from district administration and capital police in this regard.